A new venue and circuit for the Modified Live calendar and the entire scene! This circuit is simply amazing, based just outside of the Cheshire borders and in North Wales, Anglesey is a virgin to the world of the car crazy modifying scene. We're going all out to make this one a great day out as we run to the coast for the Seaside Showdown - the circuit is next to the beach, literally! Highlights including the smoking tyres of the European Drift Championship and the Time Attack Series - a 'beat the clock' challenge for highly tuned road cars. Modified Live isn't just about spectating; there are plenty of chances for you to get involved you can enter the 'show and shine' contest for the best modified road cars & much more! There is only one thing to say about Anglesey - ROAD TRIP!! Ticket Prices: TICKETS ARE NOW ON SALE! There are toilets and showers – plus 48 hook up points, water stand pipes, chemical disposal point, and yes a bar / café! We do ask that you clear the site at a reasonable hour on the Monday unless you would like to stop over and enjoy watching the track day or even take part! Saturday: Mitsubishi Lancer Register Track Day & Time Attack Testing. Monday: Open pit lane Track Day on the International GP circuit Visit (www.circuit-days.co.uk) to book. 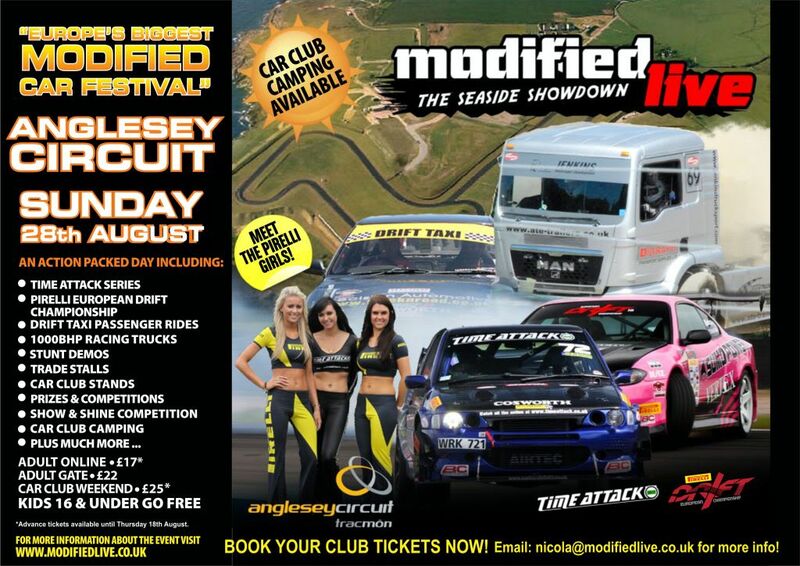 To Book your club stand please email Nicola@modifiedlive.co.uk for a club booking form! The deadline for the payment is Thursday 18th August!! Well not long to go now guys and girls! Only 19 days to go and only 9 days till the Club Booking deadline (Thursday 18th August at 11:59pm) So dont forget to get your club booked in if you are interested in attending - Please make sure you email me on Nicola@modifiedlive.co.uk for a club booking form or if you have any questions regarding the event.